Thankyou all for the tips. I will be keeping my OEM tailgate as i use the backup camera all the time when unhooked. 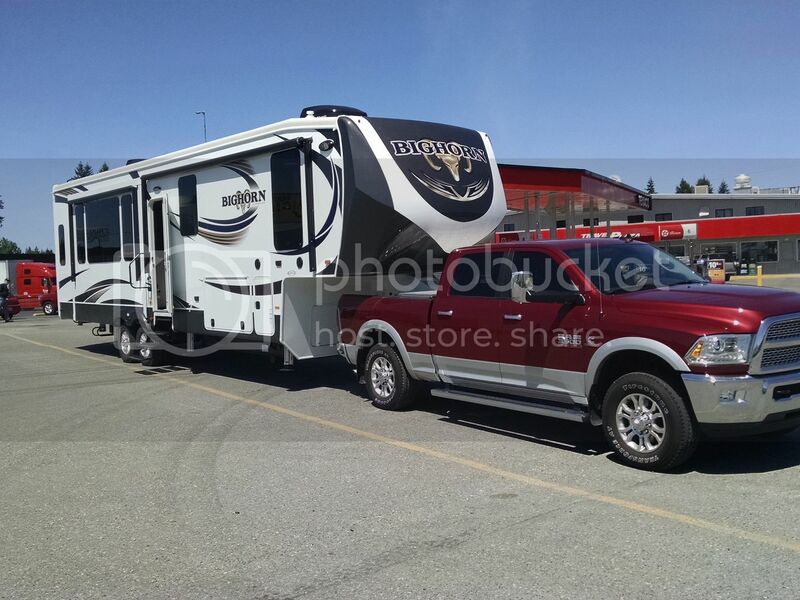 I don't have a 5th wheel, but I do have a 2010 F150 that I'd remove the tailgate to take our golf cart when towing our previous travel trailer. Each time I'd have to climb under the vehicle to disconnect the tailgate camera. I finally decided I didn't like being without the camera when unhitched, and the tailgate is at home. I connected a cheap license plate camera to the modified stock camera connector to add a 12V plug and an RCA plug to connect. This made hitching MUCH easier, and still gave me a backup view when not towing. I then went a step further, put a camera on the back of the travel trailer, and would connect that cable to the modified F150 camera connector. The image below is the monitor built into the rear view mirror, looking behind the travel trailer. Rather than mount the camera to the license plate, putting it near your 3rd brake light would probably help hitching your 5ver. That's funny you should say that. I have a v-tailgate, and last night I loaded up a plastic cart I had built to haul supplies from the house out to our trailer. Went to unload it this morning before work, and it was gone. Blew out somewhere along the highway. 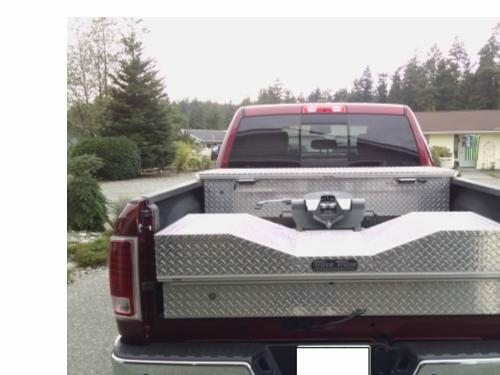 And we have lost stuff with this type of tailgate, but never have to lower it to hook up. Don't get that part. Crutchfield has several cameras that might be able to be added to the fifth wheel tailgate maybe below the handle to open it and between the louvers. Here is one. I also have a V tailgate. Looks to be the same manufacturer as this one but one, maybe two louvres shallower. I still need to be careful with it & have a couple dings in it when not enough care was given. After awhile you learn how high you need to be if you have lowered the trailer front end after hitching. Every trailer is different. My leg switches are under the overhang driver side. I raise the trailer till my nose touches dead center of a front corner marker light above the switches. Perfect clearance on flatish ground to go over the V & touch the 5th wheel at center of plate. My pin clears the vee easily if I am on reasonbly level ground. But every rig will be different. Varies by how high your hitch head is, and how low your pinbox is. Two rigs with the same bed clearance, one could hit and the other clear. You still have to be careful. I bumped mine last season. Ground wasn't level.